Ace Stamp Works was established in 1931. Located at 328 South Jefferson, in Chicago (a wide kiddy corner from Lou Mitchell's on Jackson), it is the source for all your rubberstamp and marking device needs. Besides carrying all of Queenie's designs, Ace sells very serious practical and down to earth things, like address stamps. Custom logos are available on all rubber and self-inking stamps as well as embossing seals. You can call Bruce or Mark Klage, the father-son team that run and own the family owned company at 800-239-9328. 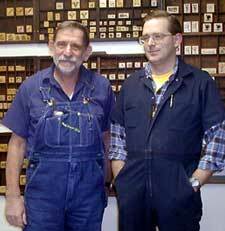 Ask for their free master type face catalog, but please tell the dynamic duo that Her Rubberstampness sent you! How did Ace Stamp Works meet the Rubber Stamp Queen? Well, light years ago, on another planet, her rubberstampness who sold a number of unicorn stamps, had a big order from New York, a store called Unicorn City, that only sold unicorn related items. Her supplier in California, never believing that anyone would order one much less 200 unicorns, couldn't deliver on time. She was forced to look for a local supplier- so she went in and met with the owner of Ace Stamp Works, and ordered two hundred gorillas. © Letters, 2009 All rights reserved.